Sometimes we need to be reminded why we're here. Why are we living cross-culturally? Why did we choose to leave our lives of comfort to serve the Lord in another country? Why did we choose to be missionaries? The other day, we had a delivery man at our door. While I was receiving this delivery, he tried to make conversation with us. He made a comment about our son's accent sounding like the local accent, which led to him questioning me why my husband and I would choose to live here if we're both American. It seemed this man couldn't get his mind around why we'd choose to work for our organisation here, when we could give our children a "better life" in America. I'll be honest—I struggled not to get angry with this delivery man after he left. He genuinely didn't understand why we'd come to this part of the world to work for a charity. But that's just it. Our jobs as missionaries don't make sense to the rest of the world. Serving God is foolish to them. And that's why we're here: To serve the Lord and bring the Gospel to those who need it. We're lights shining in the darkness. We should use situations like this to shine even brighter for the Lord. 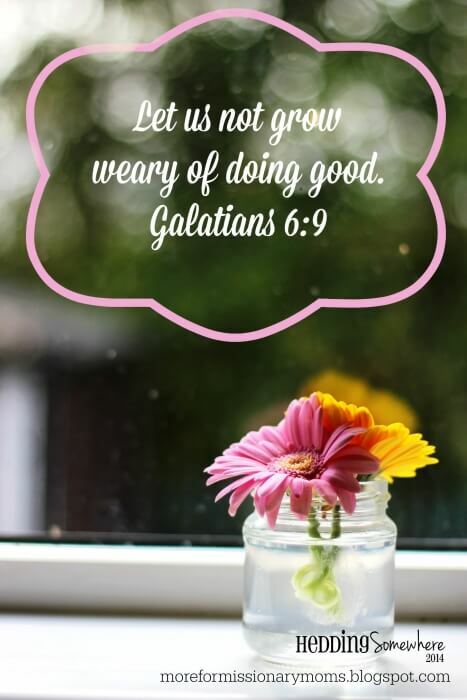 Sisters, don't let yourself grow weary as you're doing the Lord's work. We shine in the darkness. We'll see the fruit of our work in God's time. Even when people question our choices. Thank you for this today. I am definitely feeling weary these last few days and I needed this little reminder. Bless you, Danielle! I'm glad you were encouraged. I hope God will give you extra strength in the next week! Tuesday Together: Time for coffee!